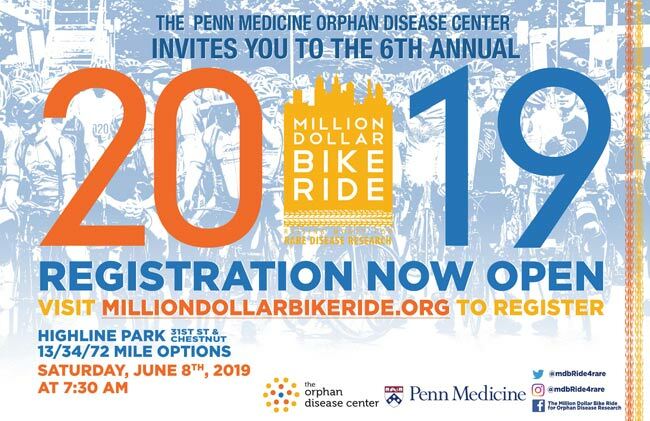 The Penn Medicine Orphan Disease Center (ODC) will host the 6th Annual Million Dollar Bike Ride on Saturday June 8, 2019 to raise money for rare disease research. Our Raring to Go for CHI Team is gearing up to raise funds for hyperinsulinism research once again and we need you! There’s multiple ways for you to get involved, and we hope you can join us in raising research funds for new treatments for congenital hyperinsulinism (HI). Your fundraising dollars will be used for an innovative, pre-clinical or clinical study designed to improve the diagnosis, therapy, or quality of life for those affected by congenital hyperinsulinism. 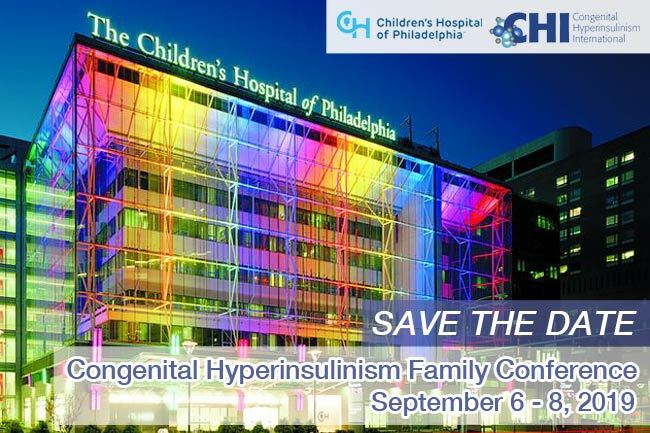 Congenital Hyperinsulinism International (CHI) and The Childrens Hospital of Philadelphia (CHOP) are hosting the 2019 CHI Family Conference in Philadelphia, PA on September 6-8, 2019. The conference will take place at the Colket Translational Research Building at CHOP located at 3501 Civic Center Blvd, Philadelphia, PA 19104 and the Sheraton Philadelphia University City located at 3549 Chestnut Street, Philadelphia, PA 19104. Click here for more information and to register now. September 20-22, 2019, in Vienna, Austria. 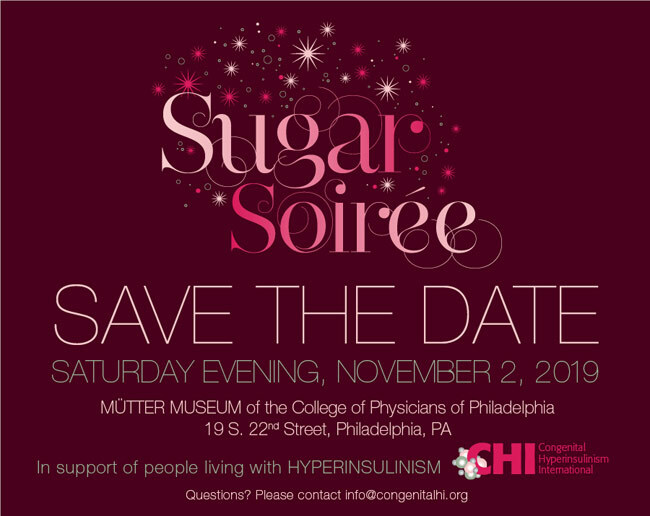 The 2019 Sugar Soirée will take place on Saturday evening, November 2, 2019 at the the Mütter Museum of the College of Physicians of Philadelphia. 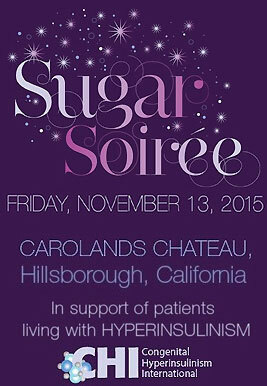 The Sugar Soirée is CHI’s premier annual awareness and fundraising event. A limited block of rooms has been set aside at a special rate for the Sugar Soirée at the Sonesta Phildelphia Rittenhouse Square, 1800 Market St. Philadelphia, PA 19103. Sonesta Hotel Reservations (before October 5, 2019). More information on tickets and sponsorships will be coming soon. Please click here to read the highlights and see photos from the Sugar Soirée. 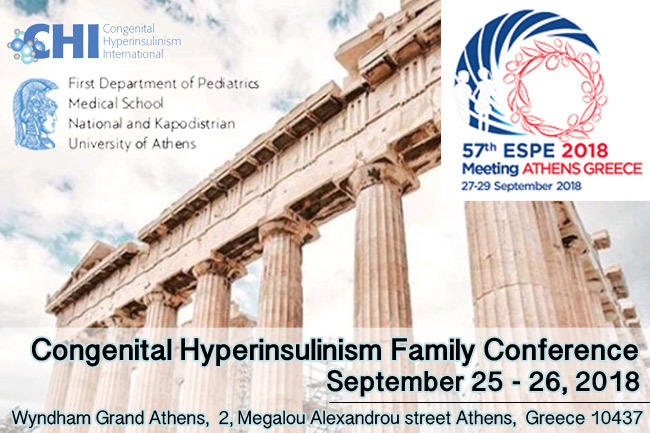 On September 25-26, 2018, Congenital Hyperinsulinism International (CHI) in partnership with the Medical School of the National Kapodistrian University of Athens, held the 2018 Athens Congenital Hyperinsulinism Family Conference in Athens, Greece. The conference took place at the Wyndham Grand Athens. 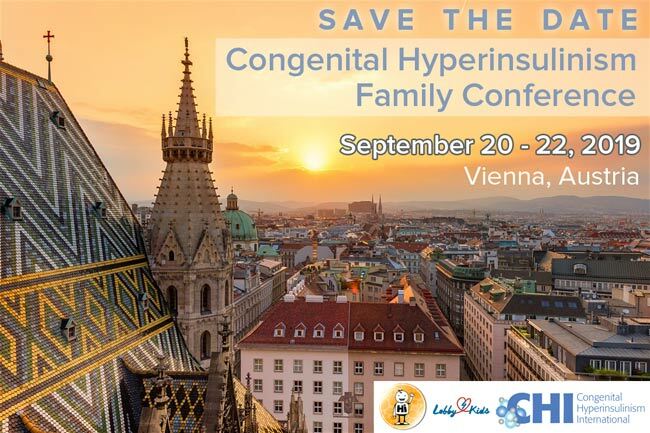 The conference featured world-renowned physicians, researchers, and specialists who treat children with congenital hyperinsulinism (HI), as well as parent and patient advocacy leaders. There were opportunities for HI families to meet and share their experiences with other HI families. The conference was a fantastic opportunity to learn more about all aspects of the condition and to meet and get to know members of the global HI community. Click here for a review of the conference and a slideshow of highlights! Every day with HI is a Roller Coaster … but not every day with HI is ROLLER COASTER DAY! 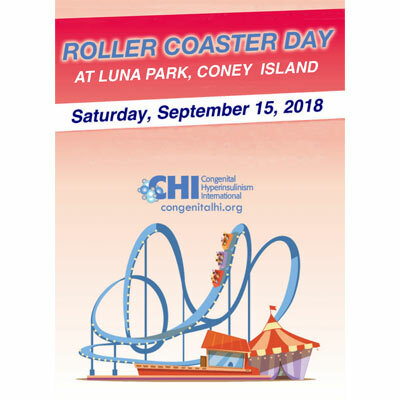 On September 15th, 2018, CHI hosted our first-ever Roller Coaster Day at Luna Park, Coney Island in Brooklyn, NY, and it was a day of fun for family and friends! Click here for a slideshow from the event. 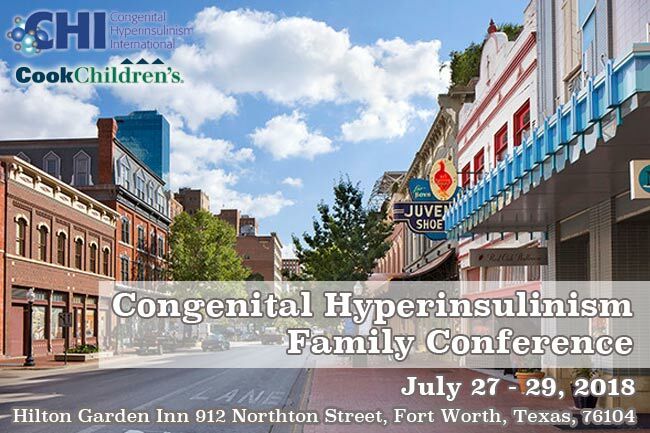 Congenital Hyperinsulinism International (CHI) and Cook Children’s hosted the 2018 Congenital Hyperinsulinism Family Conference, July 27-29, 2018 in Fort Worth, Texas. Click here for an overview and a slideshows of highlights from the event. 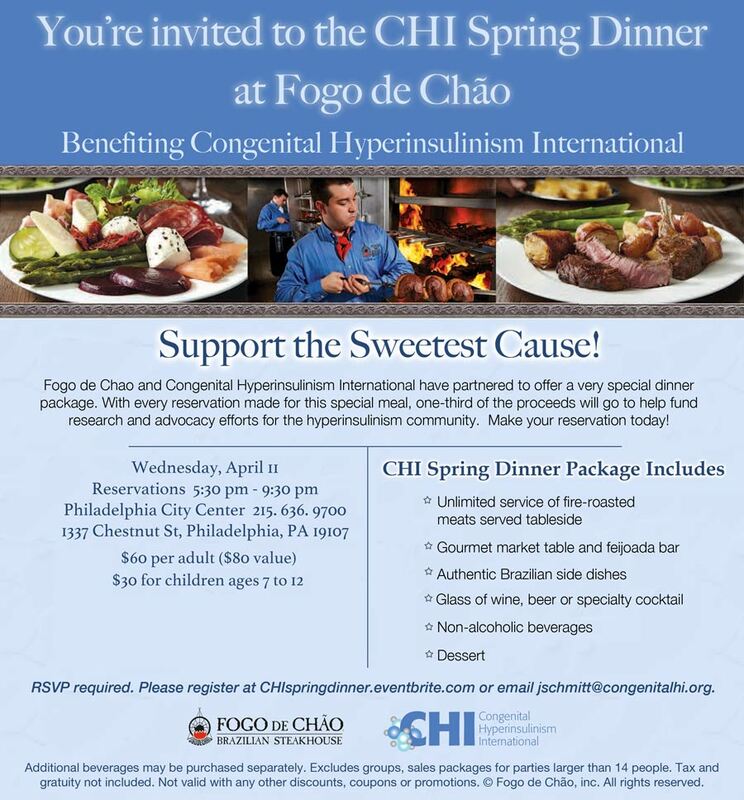 The CHI Spring Dinner at Fogo De Chão was such an enjoyable evening. We are so grateful to all who came out to support CHI and dine with us last night, and especially to Thaïs Stuart for making this event happen. Thank you to Fogo de Chão for generously contributing to CHI and for serving such a delicious meal. It was so nice to connect with HI families and the CHOP HI team. CHI is very excited to have participated in an event commemorating Rare Disease Day in Trenton, NJ on March 5, 2018, organized by the New Jersey Rare Disease Alliance. One of the two panel discussions, “A Collaborative Approach to Rare Disease Treatment Development” was moderated by CHI executive director, Julie Raskin, and included as panelists CHOP Congenital Hyperinsulinism Center Pediatric Endocrinologist, Katherine Lord, MD, and Susanne Fitch, Commercial Advisor to Zealand Pharma. Zealand Pharma is developing Dasiglucagon for HI. The event took place at the New Jersey State Museum, 205 W. State Street, Riverview Court (1st floor), Trenton, from 8:30 a.m.- 12:30 p.m. Entitled “A Better World for People Living with Rare Diseases: State, National, and Global Action,” this year’s event featured Congressman Leonard Lance, Co-Chair of the Rare Disease Caucus of the United States Congress, as the keynote speaker. Co-sponsored by the National Organization for Rare Diseases (NORD), the HealthCare Institute of New Jersey (HINJ) and BioNJ, the event began with networking and a continental breakfast followed by two panels, “Effective Advocacy – Real World Advice” and “A Collaborative Approach to Rare Disease Treatment Development.” Panelists featured representatives from the rare disease community including patients, patient advocates, biomedical healthcare professionals, and industry leaders. Attendees also heard from members of the New Jersey legislature. Following lunch, all in attendance were invited to walk to the State House and engage with legislators and staff about issues of concern to the rare disease community. 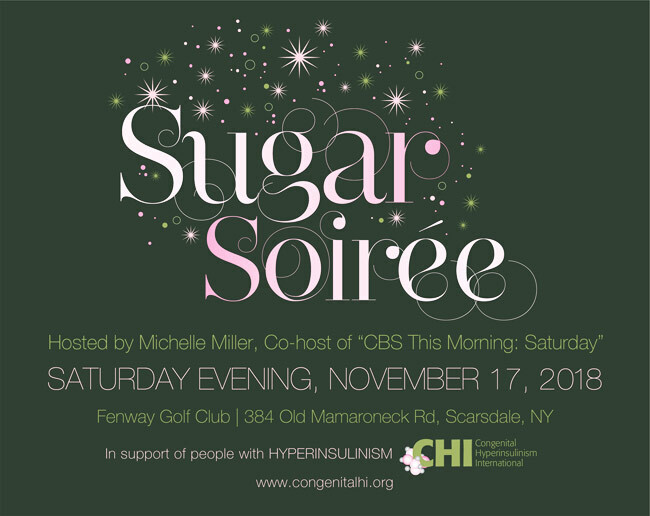 Congenital Hyperinsulinism International (CHI) held its annual Sugar Soirée, hosted by Conan O’Brien, on November 19, 2017 at the Pool and the Grill Restaurants in the Seagram Building, in New York City. With your generous support, the 2017 Sugar Soirée was a great success. With 290 people in attendance and many more donating in honor of the event or participating in the auction, we are overwhelmed by your generosity. Please note: We are still accepting donations! Please click here to learn more about the highlights of this event. 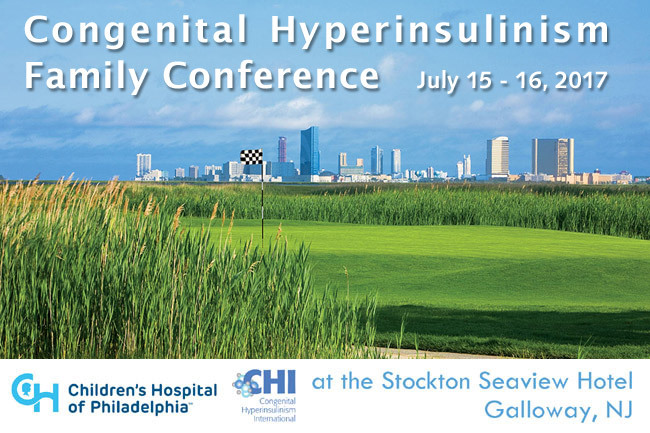 On July 15-16, Congenital Hyperinsulinism International (CHI) and the Children’s Hospital of Philadelphia (CHOP) co-hosted the Congenital Hyperinsulinism (HI) Family Conference at the Stockton Seaview Hotel in Galloway, New Jersey. Click here for a review and highlights from the conference. The 2016 Sugar Soirée, took place on Saturday, November 5th, 2016, at the Renaissance Boston Waterfront Hotel, in Boston, Massachusetts. Click here for an overview of the event and an extensive slideshow. Click here to read a press release about N. Scott Adzick receiving the CHI Be My Sugar Award for Surgical Excellence at the third annual Sugar Soirée. 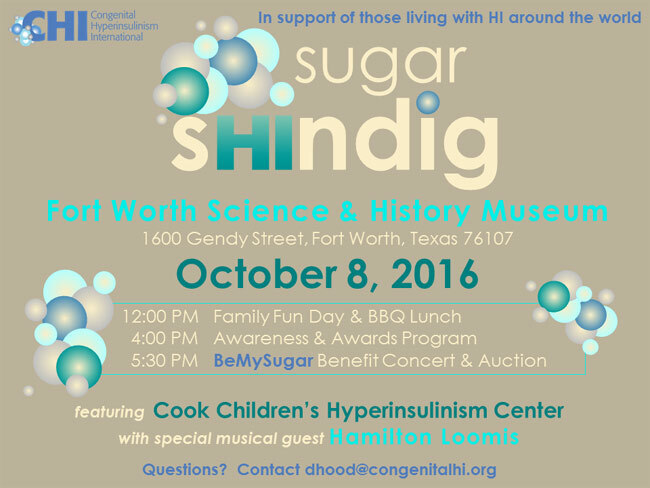 Congenital Hyperinsulinism International (CHI) hosted its second annual Sugar Shindig on October 8, 2016 at the Fort Worth Science & History Museum. 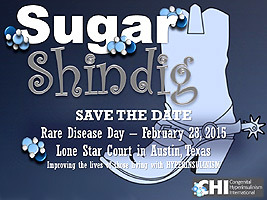 The Sugar Shindig is a family fun event dedicated to: raising awareness of hyperinsulinism (HI) and diabetes caused by HI; highlighting the work done by Cook Children’s Hyperinsulinism Center and CHI to improve the lives of those living with this rare disease; and raising funds for the ongoing work toward timely recognition of hypoglycemia to reduce brain damage and death. Together with generous supporters, CHI achieves its mission to improve the lives of people living with HI! Click here to get highlights and to view a slideshow from the day’s events. 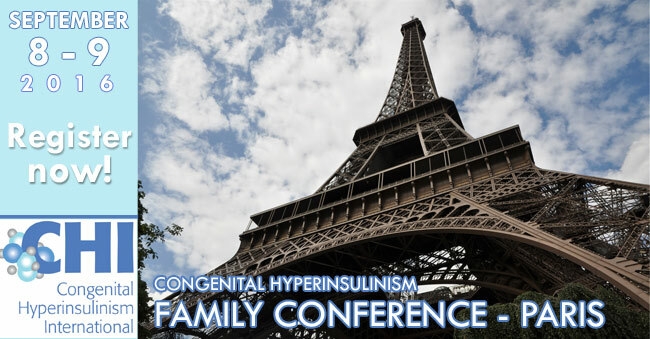 Congenital Hyperinsulinism International (CHI) with Necker Hospital hosted the Congenital Hyperinsulinism Family Conference in Paris on September 8-9, 2016. We have posted a video with highlights from the Paris Conference. We also have an extensive slideshow with an in-depth look at the Conference here. The Million Dollar Bike Ride which took place in Pennsylvania on May 7 was a great success. It was a rainy day, but this did not stop the enthusiasm. The entire team showed up and rode as planned. 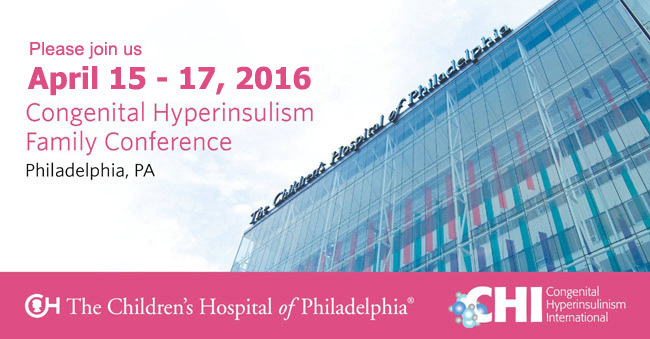 Congenital Hyperinsulinism International (CHI) and the Children’s Hospital of Philadelphia (CHOP) hosted the Congenital Hyperinsulinism Family Conference in Philadelphia on April 15-17, 2016. Click here to see video presentations from the conference, and visit our Family Conference Presentations page to view PDF versions of these same lectures as well as additional topics not included in the video section. 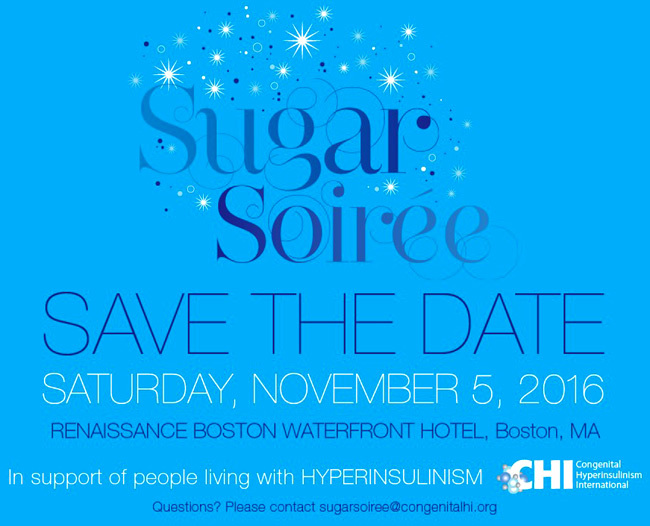 On November 13, 2015, Congenital Hyperinsulinism International (CHI) held the 2015 Sugar Soiree, an evening dedicated to raising hyperinsulinism awareness and funds for research, education, and support. The event took place at the Carolands Chateau, a stunning mansion designed by renowned French Architect, Ernest Sanson. The grand home has been described as the Downton Abbey of California, and has been the subject of a PBS full length documentary. The philanthropic Johnson family donated the home to be used exclusively for charitable events and CHI is a lucky recipient, having been selected to hold its signature event at the Chateau. Click here for a slideshow of highlights from the 2015 Sugar Soiree. Sharon’s Sugar Shake-Up was a 5K road race set up to honor Aneesh Jai Kaul, who was born on February 16, 2015 and died on March 11, 2015 from lack of oxygen due to Congenital Hyperinsulinism. In order to keep Aneesh’s legacy alive, the proceeds of this race were donated to Congenital Hyperinsulinism International (CHI), the organization dedicated to improving the lives of people born with hyperinsulinism. 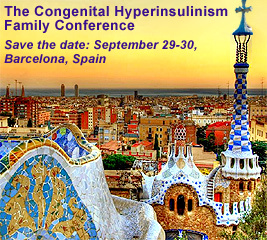 On September 29-30, 2015 Congenital Hyperinsulinism International (CHI) and Sant Joan de Déu Children’s Hospital hosted the 2015 Barcelona Congenital Hyperinsulinism Family Conference at the Sant Joan de Déu Children’s Hospital in Barcelona, Spain. Click here for highlights from this event. Click here for a slideshow and overview of this event. 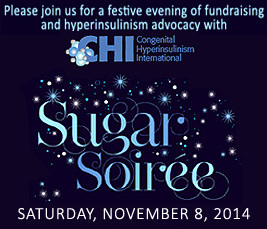 On Saturday, November 8, 2014, Congenital Hyperinsulinism International (CHI) hosted a festive evening of fundraising and hyperinsulinism advocacy at the City Winery in New York. The Sugar Soiree is NYC’s sweetest gala – and it included a VIP cocktail hour, delicious dinner and drinks, and a wonderful program including first class musical entertainment, CHI’s new film, and a lifetime achievement award for Dr. Charles Stanley. Click here for an overview and a slideshow from this event. 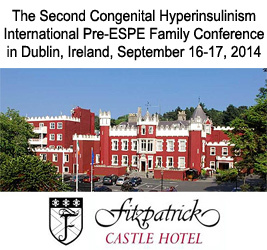 Congenital Hyperinsulinism International (CHI) hosted the Second Pre-ESPE CHI Family Conference at the Fitzpatrick Castle Hotel in the south Dublin suburb of Killiney during September 16-17, 2014. World-renowned physicians, researchers, and specialists who treat children with congenital hyperinsulinism, and parent and patient advocacy leaders spoke at the conference. There was ample opportunity for meeting and sharing experiences with other families who have children with congenital hyperinsulinism. We will have highlights from the Conference posted soon – please check back for our coverage. 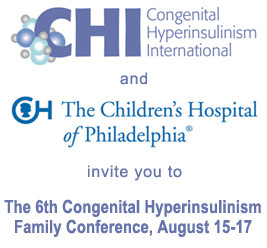 Congenital Hyperinsulinism International (CHI) and The Children’s Hospital of Philadelphia (CHOP) hosted the Sixth Congenital Hyperinsulinism Family Conference during August 15-17, 2014, at the Stockton Seaview Hotel in Galloway, NJ. World-renowned physicians, researchers, and specialists who treat children with congenital hyperinsulinism, and parent leaders in the fields of education, psychology, research, and advocacy spoke at the conference; you can review their presentations here. There was also ample opportunity for meeting and sharing experiences with other families who have children with congenital hyperinsulinism. Please click here to see a slideshow from the event. 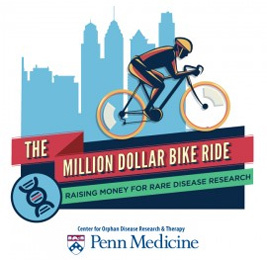 CHI is pumped to announce we will be participating in the first Million Dollar Bike Ride sponsored by The Penn Medicine Center for Orphan Disease Research and Therapy (CODRT) on May 3, 2014. This event will raise awareness of rare diseases while raising funds for rare disease research. Please click here or on the image at left for more information. 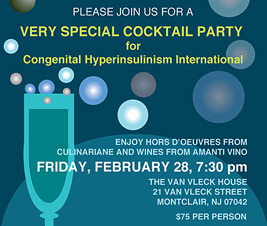 The Very Special Cocktail Party for Congenital Hyperinsulinism International took place on Friday, February 28th. It took place at the Van Vleck House in Montclair, New Jersey. 120 people attended from Texas, Georgia, New York, Pennsylvania, Massachusetts and New Jersey. Guest speakers included Mireille and Brian Ptak, HI parents; Doctors DeLeon, Stanley, and Thornton; Nurse Practitioner, Enyo Dzata, and CHI Intern Rianna Sommers presenting a video from an international group of HI families. At the event some HI families and individuals met for the first time, creating new bonds while old friends got to catch up, and the CHI community was strengthened by the support of all those who attended. We learned about new research and initiatives, the work being done to increase early diagnosis, and challenges and triumphs of HI families. The event was also a very successful fundraiser to support CHI. The event was made possible by our sponsors, XOMA, BioMarin, Sean and Sue Cullinan, and Amy Graydon and Dan Kaplan, and everyone who donated to the event. Please click here to see a slideshow from the event. 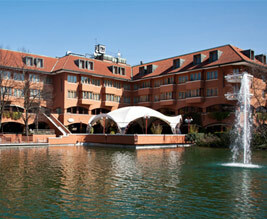 The 5th Congenital Hyperinsulinism International (CHI) Family Conference took place near Milan from September 17th – 18th, 2013. The event was held in conjunction with the 9th Joint Meeting of Paediatric Endocrinology. The events took place on September 17 – 18 at the NH Milano 2 Hotel (seen at left) just outside of Milan in the suburb of Segrate. We were joined by members of the CHI Scientific Advisory Group (SAG) and other prominent pediatric endricrinologists and specialists. Click here to view their presentations that were made during the conference. Click here for more information and to see a slideshow from the event. On June 15th and 16th, 2013, CHI held the Congenital Hyperinsulinism International Endocrine Society Meetings. At the meeting, leading world specialists in the field presented on some of their latest research findings and updated participants on their hyperinsulinism centers. There were also presentations on HI at school, parenting the HI child, and a special report on HI care in Latin America. HI patients, parents and caregivers all had an opportunity to pose questions to leading experts in the field of HI and to have an important exchange of ideas between physicians, nurses, members of the biotech industry, and HI family members. 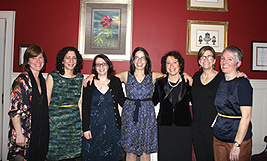 On Thursday, February 28, 2013, we gathered on Rare Disease Day for a cocktail party in support of Congenital Hyperinsulinism International (CHI). The gathering took place at the Van Vleck House in Montclair, NJ, and included hors d’oeuvres and wines from Culinariane and Amanti Vino. Click here to view a slideshow with highlights from the event. 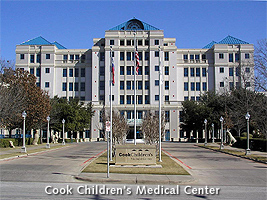 Congenital Hyperinsulinism International and The Hyperinsulinism Center of Cook Children’s Hospital of Fort Worth, Texas hosted an evening dedicated to families affected by congenital hyperinsulinism. The Congenital Hyperinsulinism Endocrine Society Dinner Meeting took place on June 23, 2012 at the Table 7 Bistro at 720 Fannin Street in Houston, Texas. The families who attended had the chance to meet and discuss issues of concern with leading pediatric endocrinologists, HI researchers, and other HI experts. There was also an opportunity to speak informally with other HI family members. Additionally, researchers and physicians shared information about their projects, research and practice. 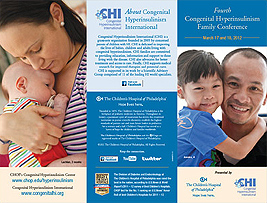 Congenital Hyperinsulinism International (CHI), in conjunction with the Children’s Hospital of Philadelphia (CHOP), hosted the fourth Congenital Hyperinsulinism Family Conference on March 17 – 18, 2012. Conference attendees learned about recent advances in the diagnosis and treatment of congenital hyperinsulinism (HI) from experts in the field representing the leading international HI centers. In addition to the learning opportunities, there was ample time for networking with other HI families. Click on the image at left to view the PDF brochure from this event. 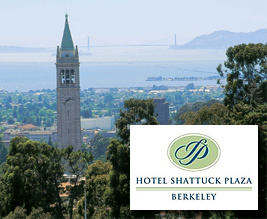 Click here for an overview of presentations made at this conference. The third CHI Family Conference was held June 18 & 19, 2010 in San Diego, CA This conference is intended for individuals with Congenital Hyperinsulinism (HI) as well as family members and caregivers of those with HI. Speakers and participants joined us from around the globe. 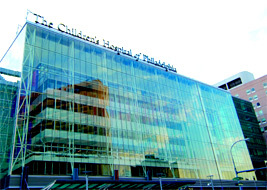 The second Congenital Hyperinsulinism Family Conference sponsored by Congenital Hyperinsulinism International (CHI) and the Children’s Hospital of Philadelphia Congenital Hyperinsulinism (CHOP) Center was held on June 17 and 18, 2006. The conference was held at the City Line Holiday Inn in Philadelphia, PA.
At this conference leading specialists discussed treatment options, management techniques, genetic advances and potential future strategies. There were also sessions on parenting children with HI, HI in the school setting, and nutrition and feeding. Additionally, there were sessions for children and teenagers with HI and their siblings.